We have a nursing mommy here at our place who is making a valiant effort to avoid chocolate–for Baby Chomp’s sake, and at Valentine’s season too–poor thing. So in an effort to be supportive, we’ve been on the lookout for sweetheart treats that don’t use the dreaded cocoa bean. Mix all ingredients except vanilla in a saucepan. 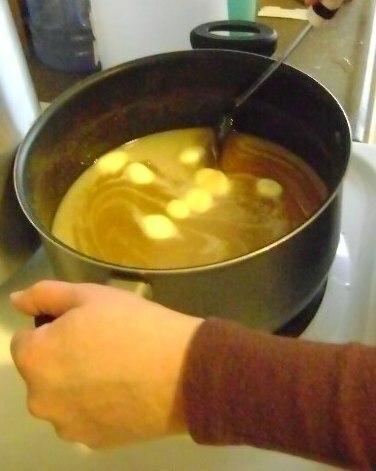 On low heat, stir constantly until butter is completely melted and sugar is dissolved. Don’t get impatient and up the heat, or stop stirring or the cream could scorch. Once sugar is dissolved, increase heat to medium. Heat to boiling–keep stirring! Once it’s boiling, you can lay off on the stirring, just occasionally should do the trick. Let it boil (gently–again, don’t turn up the heat) until you can drip some in a cup of ice cold water and it firms up just a bit–not enough to pull your teeth out, just enough that you can eat it, and it stays intact and chewy. If it just dissolves in the water–it’s not ready. It should take about 8-10 minutes. (I have used half-and-half when I didn’t have heavy cream, and it took more like 20 minutes cause of the extra water…they also weren”t as rich.) Remove from heat. When it’s ready, pour into a greased 8×8 pan or pie tin. Let cool completely, then cut with a metal spatula. It works much better than a knife, trust me. 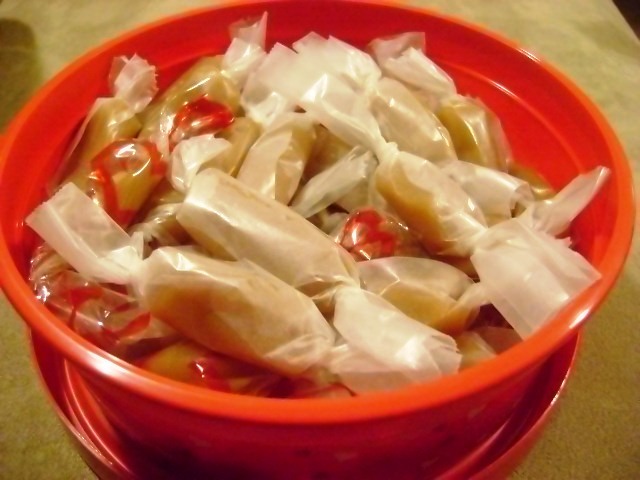 Then, if you want, you can wrap individual pieces in wax paper or decorative cellophane. Mix all ingredients except vanilla in a saucepan. 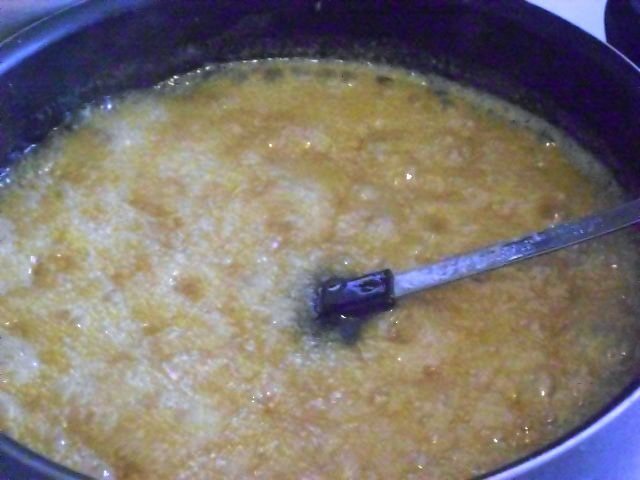 On low heat, stir constantly until butter is completely melted and sugar is dissolved. Once sugar is dissolved, increase heat to medium. Heat to boiling--keep stirring! Once it's boiling, you can lay off on the stirring, just occasionally should do the trick. Let it boil (gently--again, don't turn up the heat) until you can drip some in a cup of ice cold water and it firms up just a bit. It should take about 8-10 minutes. 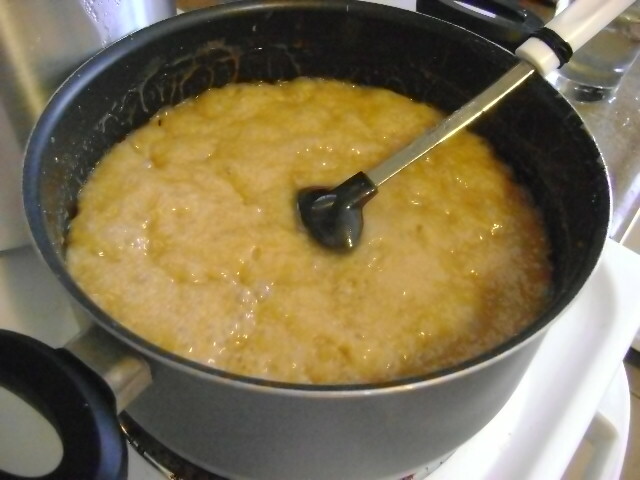 Add the vanilla after the caramel has stopped bubbling and boiling. Just stir it in with a spoon. When it's ready, pour into a greased 8x8 pan or pie tin. Let cool completely, then cut with a metal spatula. Then, if you want, you can wrap individual pieces in wax paper or decorative cellophane. You forgot the part about scarfing it at the end! 😉 It SOOO shouldn’t stop after wrapping it! I need a vanilla wafer. Yum! those look great! when do you put in the vanilla?